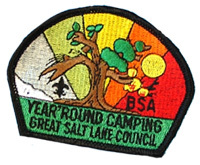 The Year Round Camping Award is an easy one to recognize your troop with if you’re already getting them out on regular monthly campouts. We’ll present this one at our first quarter Court of Honor in February. The qualifications for this award are 10 camping outings undertaken with the Scouts, Varsities or Venturers from your unit during 2009/2010, including at least one district or council sponsored event. Each campout must have 2-deep leadership. This entry was posted in Awards, Year End Summary and tagged boy scouts, bsa, camping, court of honor, monthly outings, scouting, year round award. Bookmark the permalink.